NES Teachers Corner – Page 63 – Teach STEM? We can help with that! Educators, do you need a few computers for your classroom or school computer lab? If so, the U.S. General Services Administration, or GSA, Computers For Learning program may be able to help. The program encourages and promotes the reuse of government computers by transferring “excess” computers and related peripheral equipment to schools and educational nonprofit organizations. The goal of the CFL program is to make modern computer technology an integral part of every classroom so every child has the opportunity to be educated to his or her full potential. About 400 sixth- through eighth-grade students and their teachers at NASA Explorer School Conyers Middle School in Conyers, Ga., will participate in a live downlink with astronauts aboard the International Space Station, which is scheduled to take place on Wednesday at 12:20 p.m. EDT. Selected students will ask questions of astronauts Tracy Caldwell Dyson, Doug Wheelock and Shannon Walker, members of the 24th crew who live and work aboard the station. NASA Television will broadcast video from the space station during the event. 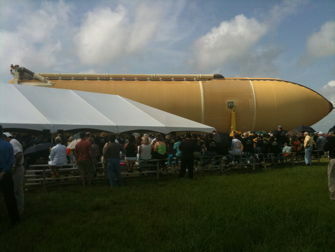 The last external tank (designated ET-138) scheduled to fly on a shuttle mission was completed on June 25 at NASA’s Michoud Assembly Facility near New Orleans. ET-138 will travel on a 900-mile sea journey to NASA’s Kennedy Space Center in Florida, where it will support shuttle Endeavour’s STS-134 launch. Taller than a 15-story building and more than 27 feet in diameter, the external tank feeds 145,000 gallons of liquid oxygen and 390,000 gallons of liquid hydrogen to the main engines. The three main components of the external tank include a liquid oxygen tank, liquid hydrogen tank and a collar-like intertank. The intertank connects the two propellant tanks, houses instrumentation and processing equipment, and provides the attachment structure for the solid rocket boosters. When ET-138 arrives at KSC, it will be mated to shuttle Endeavour and solid rocket boosters for the STS-134 mission, scheduled to launch no earlier than mid-November 2010. To read more about the mission, visit the NASA website at https://www.nasa.gov/topics/shuttle_station/features/et138_rollout.html. You and your students can read about NASA missions and what they do at https://www.nasa.gov/missions/index.html. NASA has released an interactive online tool enabling students to simultaneously visualize and manipulate three linked representations of a distance-rate-time problem. The side-by-side tool format features two airplanes (each flying at a constant speed) on merging jet routes, the corresponding distance-vs.-time graphs, and the corresponding linear equations. 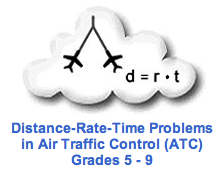 Students can manipulate an airplane’s speed and starting position on its route, rotate or shift the associated line on the graph, and change the parameters of the associated equation. As students change one representation, the other representations update accordingly. The free classroom materials include the tool, student workbooks, assessments, teacher guides, and alignments to grades 5-9 mathematics standards for all 50 states. The new tool is an addition to FlyBy Math from NASA Smart Skies — distance-rate-time investigations engaging students in the challenges faced by air traffic controllers. To access the new tool, visit http://www.smartskies.nasa.gov/flyby. To access all of the Smart Skies mathematics investigations, visit http://www.smartskies.nasa.gov/. Questions about the Smart Skies website and tools should be directed to smartskies@mail.nasa.gov. Rocks examined by NASA’s Mars rover Spirit hold evidence of an ancient wet, non-acidic environment that may have been favorable for life. Confirming this mineral clue took four years of analysis by several scientists. 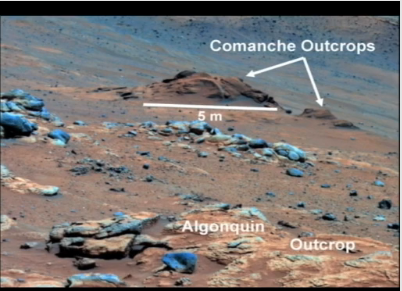 Spirit inspected many rock outcrops, including one called Comanche by scientists. They discovered magnesium iron carbonate makes up about one-fourth of the measured volume in Comanche samples. That is a tenfold higher concentration than any previously identified for carbonate in a Martian rock. Massive carbonate deposits on Mars have been sought for years without much success. Numerous channels apparently carved by flows of liquid water on ancient Mars suggest the planet was formerly warmer, thanks to greenhouse warming from a thicker atmosphere than exists now. The dense, ancient Martian atmosphere was probably rich in carbon dioxide, because that gas makes up nearly all the very thin, modern atmosphere. The remote-controlled rover traveled almost seven miles during its 11-month lunar tour, relaying thousands of TV images and hundreds of high-resolution panoramas of the moon back to Earth. It also sampled and analyzed lunar soil at 500 locations. 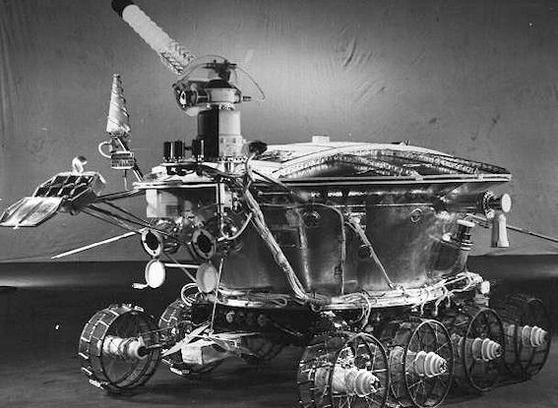 Then Lunokhod-1 was lost — until last month when NASA’s Lunar Reconnaissance Orbiter found it again. To read more about the rediscovery of Lunokhod 1, visit http://science.nasa.gov/science-news/science-at-nasa/2010/03jun_oldrover/. Saturday, June 26th, there’s going to be a lunar eclipse — and for many residents of the USA, it’s going to be a big one. The eclipse begins at 3:17 a.m. PDT when the moon enters the sunset-colored shadow of Earth. By 4:38 a.m. PDT, the moment of greatest eclipse, 54 percent of the moon’s diameter will be covered. From beginning to end, the event lasts almost three hours. Although the eclipse is only partial, it will be magnified in size and charm by the “Moon Illusion” — a result of the eclipse occurring close to the horizon from viewing sites in the USA. For reasons not fully understood by astronomers or psychologists, low-hanging moons look unnaturally large when they beam through trees, buildings and other foreground objects. In fact, a low moon is no wider than any other moon — cameras prove it — but the human brain insists otherwise. The effect will be particularly strong in western and central parts of the USA and Canada where the moon will be setting as the eclipse reaches maximum. For more information, visit http://science.nasa.gov/science-news/science-at-nasa/2010/24jun_lunareclipse/. 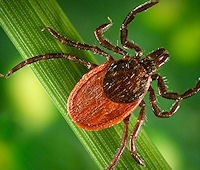 Finding a tick usually involves a squeamish self-examination — carefully rubbing fingertips through your scalp, meticulously scanning your body, and groaning “eyeww” if a little bloodsucker is discovered. But now there is a new way to discover these pesky, disease-laden critters — via satellite! Two University of Alabama at Birmingham graduate students are pioneering the new technique as part of a NASA program called DEVELOP. They’ve been using satellite images of Alabama’s Talladega National Forest to reveal likely areas of the forest where ticks may flourish. The students used what they learned from their NASA advisor, Dr. Jeff Luvall of NASA’s Marshall Space Flight Center in Huntsville, to classify levels of vegetation and moisture in 12 locations in the forest. They then created detailed digital maps and images showing likely tick habitats — areas where dense vegetation overlapped those with high soil moisture. Did you know that 53 different women including cosmonauts, astronauts, payload specialists and foreign nationals have flown in space? That six different female cosmonauts have flown with the Soviet/Russian program and 47 different women have flown with NASA? In 1963, Soviet cosmonaut Valentina Tereshkova became the first woman in space when she piloted the Vostok 6 spacecraft. Later, she married Andrian Nikolayev, another cosmonaut. Their child Yelena was the first child born to space-faring parents. Sally Ride was the first American woman in space but the third woman in space overall after Tereshkova and Svetlana Savitskaya. Savitskaya flew on Soyuz T-7 on Aug. 19, 1982. Peggy Whitson was the first woman to complete a six-month tour of duty aboard the International Space Station as the station commander for Expedition 16 in April 2008. Author Cathy GravesPosted on June 25, 2010 Categories UncategorizedTags General1 Comment on Women in Space Day! Really Simple Syndication, or RSS, is an easy way to keep up with posts to the NES Teachers Corner. Headlines, summaries and links to each post’s full text are automatically delivered to you in near real-time each time a new post is added. As an NES participant, you’ll want to keep up to date with what’s going on with the project. Information about NES live and recorded events, special opportunities and NASA mission updates will be posted on the Teachers Corner. Setting up your Web browser to automatically receive the latest project information is as easy as making a few clicks in your browser. Once you subscribe you’ll never miss updates to the NES Teachers Corner. Whenever a new post is added, you’ll see a number next to your bookmark or favorite indicating the number of new posts since the last time you visited the site. Subscribing is quick, easy and convenient. From the NES Virtual Campus home page, click on the Teachers Corner link. Then click on the small orange icon (see image with this post) in the upper right corner of the page. A browser window will open, showing all of the current posts. Add this page as a bookmark or favorite to your browser’s bookmark or favorites bar. That’s all there is to it!